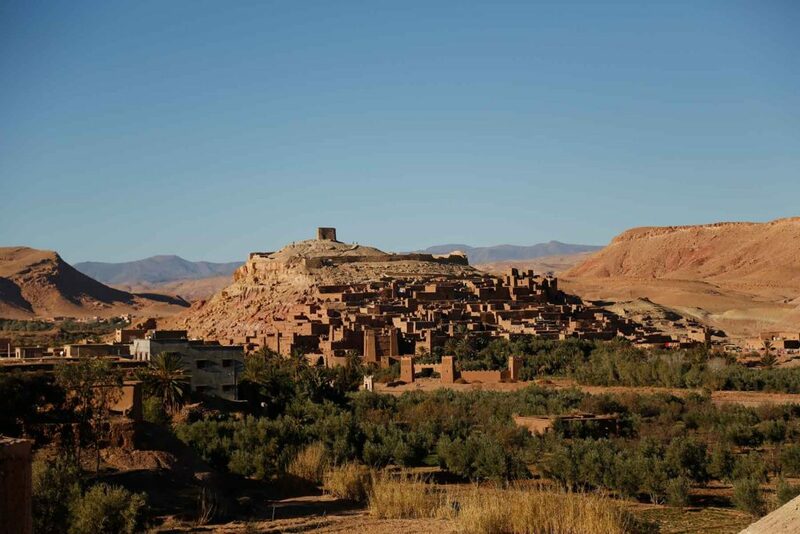 Pick up from the airport in Marrakech and transfer to your riad where you will spend the night. 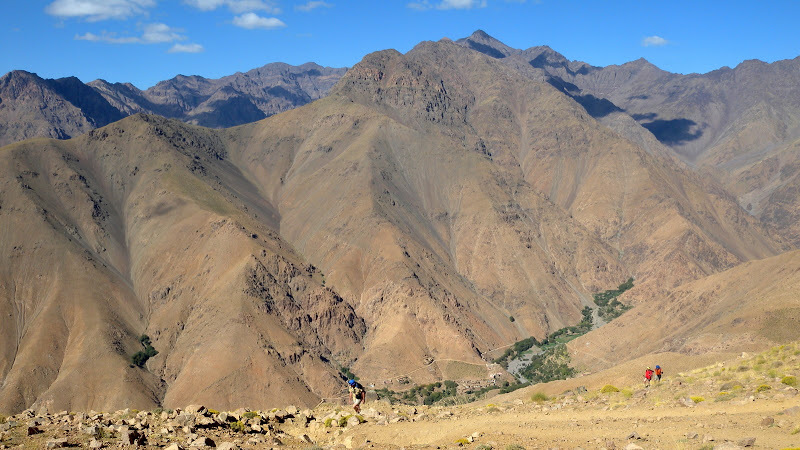 We leave Marrakech after breakfast and drive to Imlil (1740m) via Asni. Imlil is the principal trailhead for walkers. 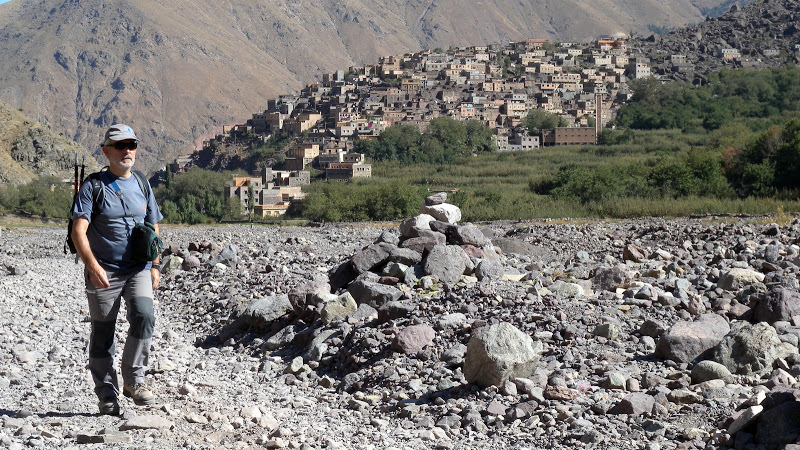 This is the place where we meet our mule team and once all our gear is loaded we begin walking along the valley towards Tacheddirt, some 8 km from Imlil. 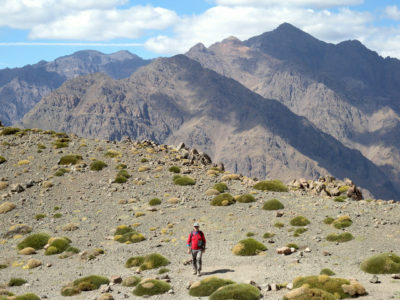 Soon the trail begins to rise as we climb up to the pass at Tizi ‘n Tamatert (2279m). 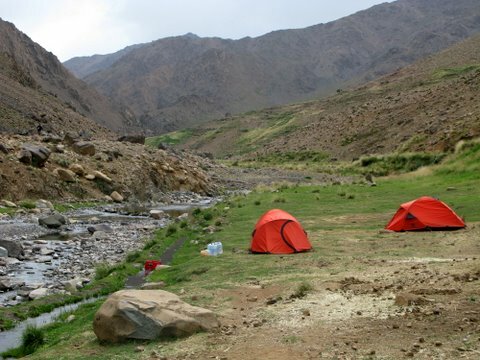 We then descend to the pretty village of Ouaneskra (2200m) and continue, for a further half-hour or so, to Tacheddirt (2300m), where we set up camp near the river. Approx. 4 hours walking. We immediately begin a long, slow ascent to the pass at Tizi Likemt (3555m). 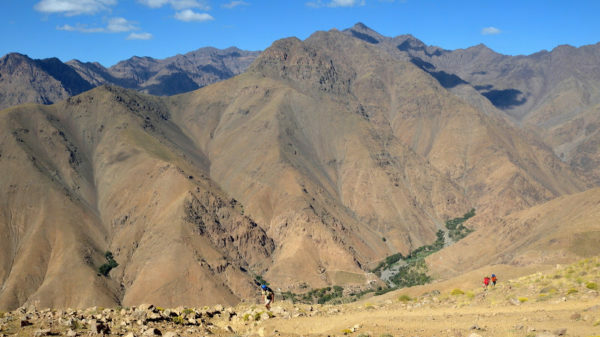 At the top we enjoy our first fine view of the Toubkal Massif before a long downhill descent to the village of Azib Likemt (2200m), where we set up our camp for the night. Approx. 5 hours walking. This day is going to be a long but quite easy day, passing many different landscapes. From Tizi ‘n Ououraine (3120m) we enjoy further views of the Toubkal Massif, including the summit, the east face and the Ifni Dome (3876m). The trail leads on towards Amsouzert (1700m), one of the most striking villages in the region, where we spend the night in a local gite or in a camp. The gite is very basic accommodation. Approx. 6 hours walking. West of Amsouzert are several small villages, which we explore as we make our way towards Ifni Lake (2300m), the only lake in the Massif. 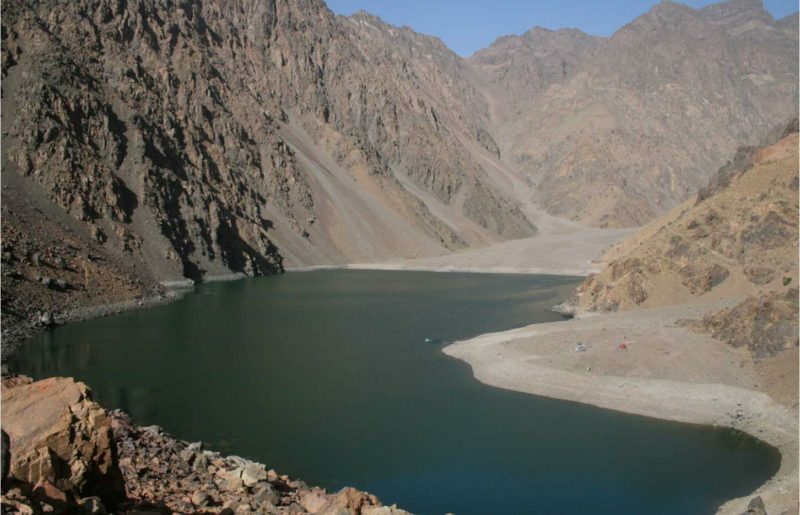 It is a memorable sight, surrounded by rocky mountains and giant heaps of rubble, and is unusually deep. We expect to arrive by lunchtime and spend the afternoon relaxing at the shore. We camp tonight in this area. Approx. 4 hours walking. 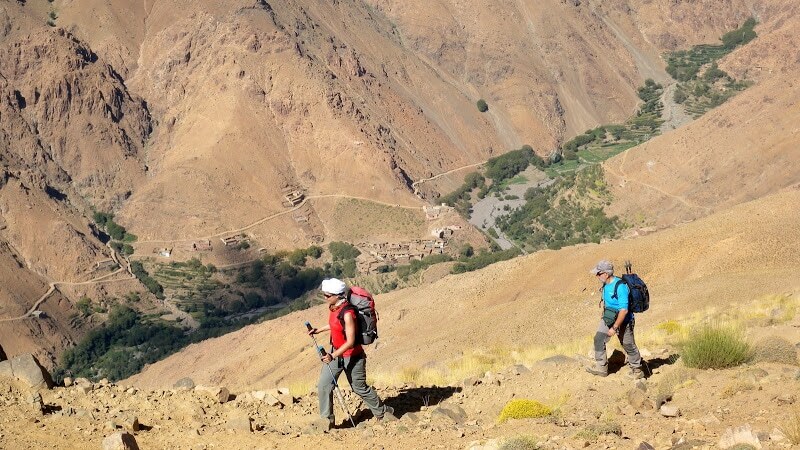 By now we should be both fit and acclimatised, and ready to tackle the hardest day of the trek. 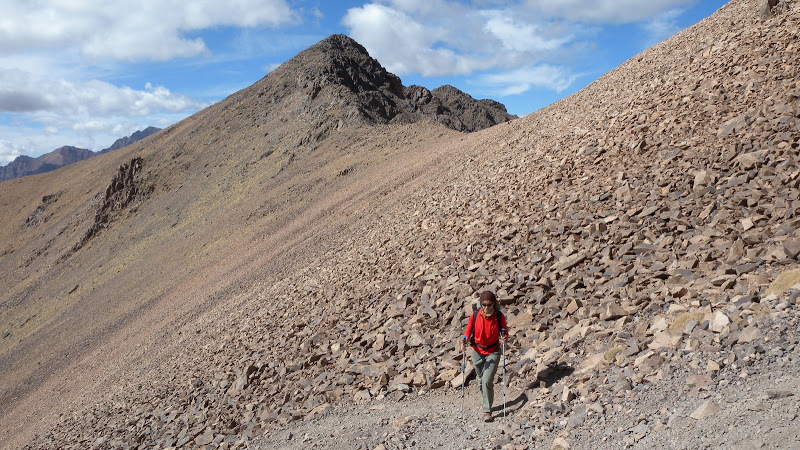 We make our way along a steep path that leads up a seemingly endless scree slope. 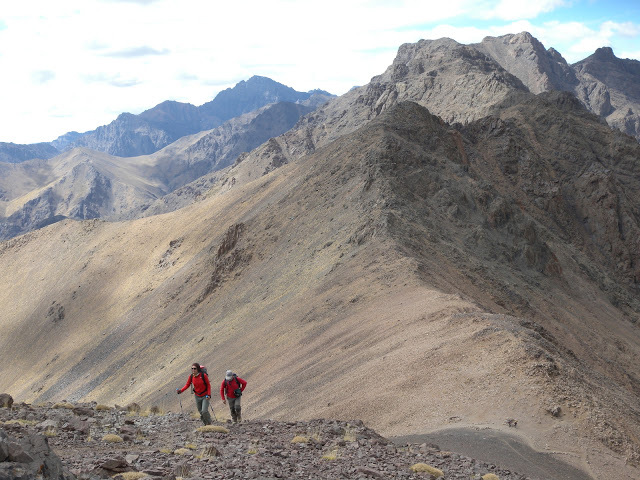 At length we reach the pass at Tizi n’Ouanoums (3664m), a narrow ledge between two shafts of rock. From here it is a long zigzag descent to Nelther Refuge (3200m), where we spend the night in tents. Approx. 6 hours walking. 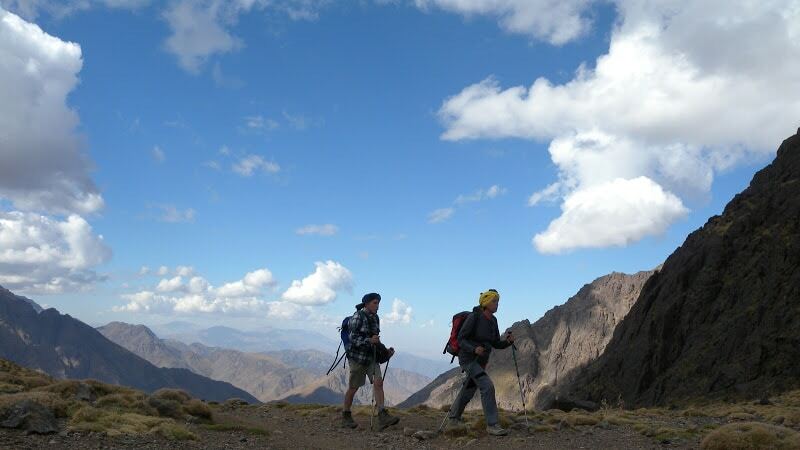 We leave before dawn, following a well-worn route to the summit of Toubkal (4167m). If conditions are good it should take no more than 2-3 hours to reach the summit, where we enjoy beautiful views of the entire Atlas range and the Marrakech plains beyond. Returning to base, we then descend fairly rapidly to the villages of Sidi Chamharouch and Aremd, before following the Mizane River, along a well-forested trail, to the trailhead at Imlil. Transfer back to Marrakech. Approx. 9 hours walking. Night in a riad. Transfer back to the airport and departure. Best trip ever ! The Guide is very professional .